In Cappiello’s later years, caricature, now more polished and refined, makes an appearance now and again. 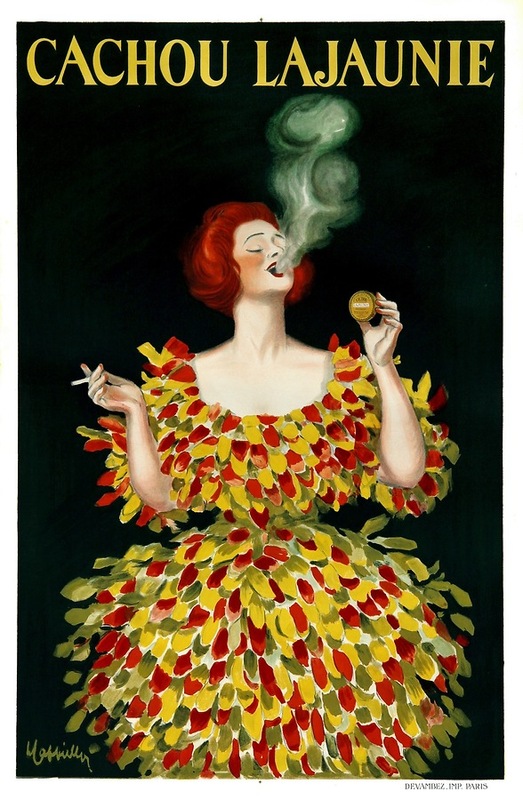 This second poster for Cachou Lajaunie (first edition created in 1906), a breath freshener to counteract the effects of her cigarette, gets our attention with a woman in a startling dress decorated with sequins in shades reminiscent of autumn foliage. The pharmacist, Léon Lajaunie, set up his pharmacy in Toulouse. After developing several invigorating elixirs, he turned to cachou, as an aromatic for perfuming the breath whose strong flavour covered smoker’s breath. The company used this [image] on promotional objects, from ashtrays to matchboxes.